The idea of Printers’ Pie as a magazine of stories and cartoons seems to date back at least to 1903, when it was (first?) published by ‘The Sphere’ to raise funds for the Printers’ Pension, Almshouse, and Orphan Asylum Corporation. The name ‘Printers’ Pie’ comes from the term used to describe unsorted type – a jumble of different letters, and the Printers’ Pension Corporation was a long-established charity. Its first Festival President was Lord John Russell in 1828 and later Presidents included Dickens, Disraeli and Gladstone amongst many other distinguished names. Over the next few years there were regular issues of Printers’ Pie, from around 1912 extended to two issues a year, with the addition of a Christmas issue under the title ‘Winter’s Pie’. From 1909 to 1918 all or most issues featured drawings by George Studdy, best known for his drawings of the dog ‘Bonzo’. After that it may have become less regular and eventually petered out. But some time around 1935 the idea seems to have been revived under a slightly different name. I have a copy of ‘Christmas Pie’ 1935, printed and published by Odhams Press, selling for 6d and now raising money not for a printers’ charity, but for the King George’s Jubilee Trust. There’s a Foreword from Edward, the Prince of Wales, soon after to become King Edward VIII, noting (in underlined text) that the entire proceeds from sale of the publication would go to the Trust. In contrast the front cover says only that the Trust would receive all profits. The list of writers, who presumably contributed stories without being paid, includes many of the leading and most popular names of the time – A.A. Milne, A.E.W. Mason, G.K. Chesterton, Warwick Deeping, Ethel Mannin and Beverley Nichols among them. All stories are illustrated, and all illustrators credited, as are the various cartoonists contributing ‘joke drawings’. It was followed in 1936 by a ‘Summer Pie’, sporting a front cover design by Bruce Bairnsfather (celebrated in the recent RSC production of ‘The Christmas Truce’). The charitable purpose of this issue is less boldly emblazoned, but profits were to go once again to the Printers’ Pension Corporation, as well as to the National Advertising Benevolent Society, a famous Fleet Street charity. ‘Christmas Pie’ 1936 returned to supporting the King George’s Jubilee Trust. With Edward having become King in early 1936, the foreword is now written by Albert, Duke of York, himself soon to become King George VI after the Abdication, and who again insists that the entire proceeds will go to the Trust. There’s a ‘Summer Pie’ 1937 too, supporting a new Children’s ward at Hornsey Central Hospital, as well as the National Advertising Benevolent Society. After that I lose track of what happens. There’s a Christmas Pie with reference to having been printed in 1939, but other references (and the lack of any reference to the war), suggest it may nevertheless be for Christmas 1938. And then in Summer 1939 there’s a final pre-war issue, with stories by Agatha Christie, Noel Coward, Sidney Horler and P.C. Wren amongst others, and a double page centrespread cartoon by W.H. Cobb. Was there a Christmas Pie in 1937 and a Summer Pie in 1938? I’ll look out for them. It’s likely though that the series was ended by the war after summer 1939, before coming back in a different form around 1943. I’ll come back to that revival in another post (now posted on this link). 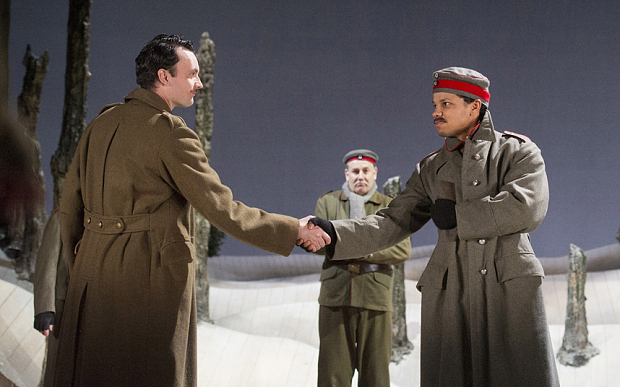 Does Phil Porter’s play create an over-sentimentalised view of war? Certainly it’s the First World War as family entertainment, the RSC’s Christmas show aimed at families and recommended for children over the age of nine. But even nine year olds these days are raised on a diet of much grittier action than this. Video games, such as Call of Duty, may be aimed at slightly higher ages, but the third Hobbit film, which I saw this week, is certainly aimed at anybody over the age of 9 and it has plenty of decapitations, stabbings and generally graphic, if slightly cartoonish, violence. Here instead we get a nurse singing Ave Maria and war reimagined as cricket, as well as the expected soldiers singing ‘Silent Night’, exchanging cigarettes and kicking around a football. The question is prompted in part by an article by Sebastian Borger, a German journalist based in London, who finds himself bemused by the British attitude to commemorating war. The trigger for his article was the Sainsburys Christmas ad, again based on the Christmas truce, and effectively using it, with the British Legion’s endorsement, to sell carrots and Christmas puddings. But it could equally have been the poppies at the Tower of London, a magnificent and moving spectacle, but one carefully calibrated to record the number of purely British military dead and treading a fine line between commemoration and celebration. Or it could have been this production. It seems undeniable that there’s been a sentimentalised side to the way that the First World War has been represented in British culture in this centenary year. Certainly this production has none of the hard-hitting punches of ‘Oh what a lovely war’ – a show that’s perfectly suitable for viewing by families, even for performing by children as I’ve seen in the past. There the description of a lovely war is loaded with irony – here at times it comes close to prosaic description, as the soldiers perform in an extended concert party routine and then kick a football around with their opponents. There are certainly darker moments and every time the action veers too close to celebration or sentimentality it has to be brought back to reality. The brightly lit opening game of cricket suddenly switches to a dimly lit recruiting office, an impromptu game of target practice between the opposing trenches is ended by a soldier being shot in the head, and the concert party is followed by the news that the soldiers are being sent over the top the next day. The casualties are grimly recorded as the fall of wickets on the cricket scoreboard. But the overall mood of the play is light and if that’s accepted as appropriate, it’s beautifully done. The idea of basing the story around Bruce Bairnsfather, one of the most celebrated cartoonists of the First World War, and a local Stratford man, works really well, and there are good performances from both Joseph Kloska as Bairnsfather and Gerard Horan as Old Bill, his most famous character brought to life. Unfortunately the scenes set in a military hospital work much less well. Were they intended as a counterpoint to the grimness of the trenches, or more cynically just as a way to create some female parts in the production, particularly as it is played by largely the same group of actors as are currently playing two other productions with stronger female parts? Either way they feel forced and the arguments between a nurse and a matron feel artificial, set up to create an unrealistic parallel with the truce being played out by the men. Whatever my doubts about the sentimentality and the structure of the play, I have to say that it was wonderful entertainment, and I guess that was its main aim. There are one or two deeper moments, as when Bairnsfather initially refuses to shake the hand of his German counterpart, prompting a reflection on how little difference there really is between the sides and between the ordinary soldiers, or when he tackles his commanding officer who insists on curtailing the truce, but these are exceptions. 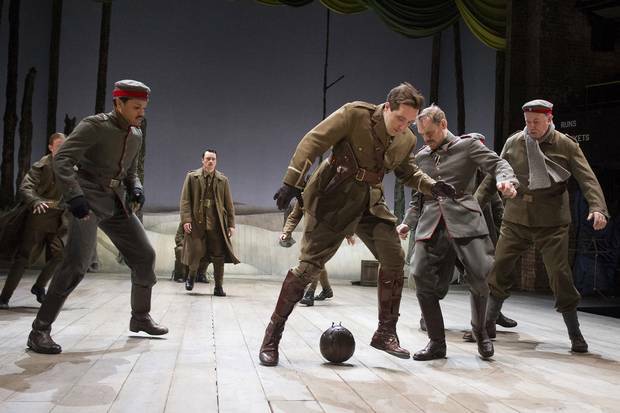 This is not a play about the futility of war, or one that draws any meaningful parallels with modern wars (anyone for a Christmas kickabout with Islamic State?). It’s just a very entertaining family show for Christmas. If that involves lots of carols and a thick layer of sentimentality, well that’s OK. There’ll be plenty of harder reality in the New Year.